STATE COLLEGE, Pa. (AP) — Pat Chambers predicted two weeks ago that opponents would soon come to respect Myreon Jones‘ sharpshooting abilities. When the Penn State freshman finally got his chance to showcase his shot against a ranked team on Tuesday night, he lived up to his coach’s billing. Lamar Stevens added 14 points and eight rebounds and Rasir Bolton chipped in 11 points for the Nittany Lions (4-2), who snapped Virginia Tech’s five-game winning streak. 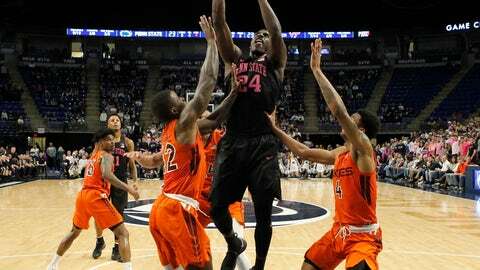 It was Penn State’s first win over a nonconference Top 25 team at home in 20 years. “He changes their team,” Williams said. Penn State’s defensive strategy was simple enough and it helped the Nittany Lions play what Chambers called their best second half of defense in his 10-year tenure. Penn State: Getting Watkins back should be a boost for a team that got 20-plus plus points in six-straight games from Stevens before Tuesday to go with a bunch of complimentary scoring from freshmen Myles Dread and Bolton. With No. 24 Maryland next, the Nittany Lions will have a shot to post back-to-back wins over ranked teams for the first time since 2011. … The Nittany Lions beat then-No. 10 Temple in 1998 at home.